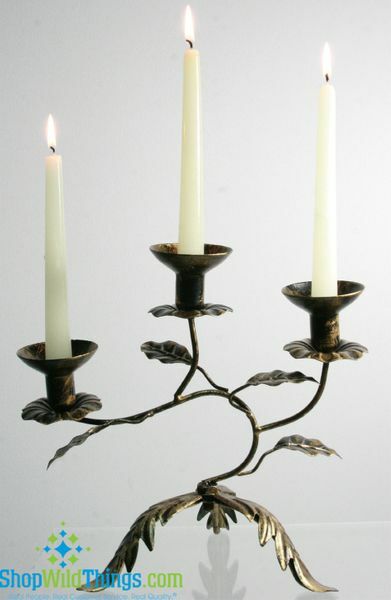 Our wonderful new "Divani" triple Candelabra is metal and finished with gold and black for a romantic antiqued look. The veins in the leaves and flowers show wonderful detail without being tacky and cheap looking. Holds 3 taper candles (not included) or you could also place votives or round candles in the semi-circle candle dish. If you'd prefer not to use pillar candles, you can also use our 4" Bell Glass Replacement candle holders! They fit perfectly in these cups.